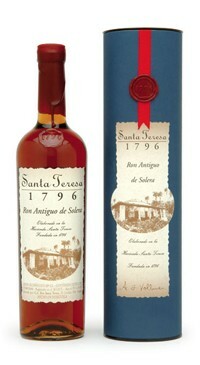 The Santa Teresa 1796 is the flagship of the distillery being aged entirely in the solera system used in the production of fine sherries, brandies, and ports. Santa Teresa 1796 represents the work of time and the reward of patience when pride is taken in every step of the production process. Santa Teresa 1796 delivers toasted cashews, stewed cherries, new leather, ripe bananas in caramel, and dark chocolate before finishing with a faint prickle of spices. Despite the incredibly creamy mouth feel, this rum finishes clean and dry and does not fatigue the palate. This is simply one of the best-kept secrets of the super-premium rum world. Anyone can find a reason to enjoy a glass of this.